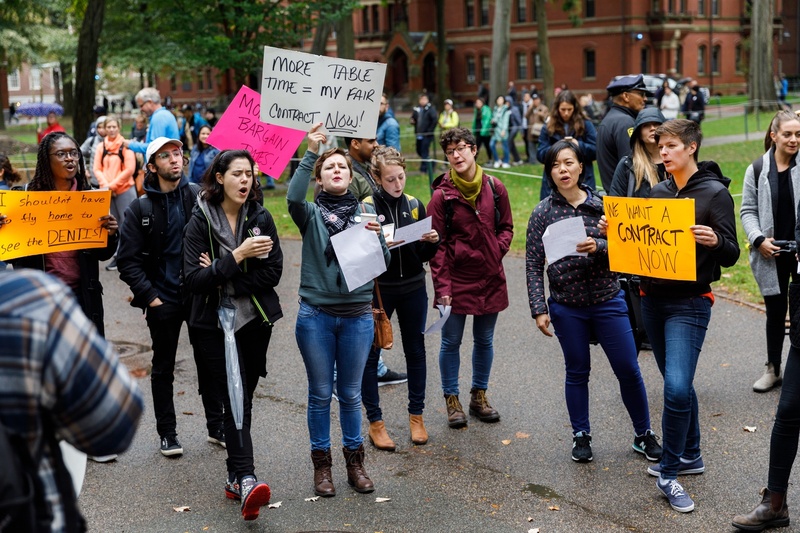 Harvard Graduate Students Union marked the launch of their historic bargaining sessions with the University in October 2018 by holding a "Bargainfest" celebration by the John Harvard statue. This Thursday, Harvard’s graduate student union will air video ads on prime-time national television criticizing the University’s response to sexual harassment complaints, according to a union press release. Harvard Graduate Students Union — United Automobile Workers is in its sixth month of contract negotiations with the University that began in October. HGSU-UAW has repeatedly called for including a provision that would allow student workers to pursue a third-party grievance procedure for sexual harassment and discrimination complaints. The ads will begin airing April 18, one year after the majority of Harvard’s eligible student workers voted to support unionization. The thirty-second advertisement — which will air on channels including CNN, MSNBC, and ESPN — opens with a narrator saying Harvard has a “world-class reputation, and a world-class #MeToo problem.” It goes on to reference the ongoing Title IX investigation into Government Professor emeritus Jorge I. Dominguez. The campaign will also extend to billboards, radio, and digital media, according to the press release. HGSU-UAW bargaining committee member Cherrie N. Bucknor wrote in an email that the union decided to run ads because the University has “consistently refused to agree” to the union’s proposals on harassment and discrimination. “We are sending a message to the Harvard administration that we will not back down,” Bucknor wrote. Bucknor acknowledged that the campaign will require “significant resources,” but she wrote that the union has the “backing” of its international affiliate, United Automobile Workers. University President Lawrence S. Bacow said in an interview Friday that third parties cannot dictate outcomes in campus sexual misconduct proceedings. University spokesperson Jonathan L. Swain also referred to previous statements on the union’s calls for these procedures. “Since October, there has been and continues to be an active exchange of proposals and counter proposals,” Swain wrote in an emailed statement. Swain also wrote that students should consider sharing their opinions about Harvard’s Title IX processes through a University-wide survey about sexual misconduct on campus. HGSU’s advocacy has also extended into the realm of city governance. The Cambridge City Council unanimously passed a policy order last Monday supporting the union in its negotiations with the University. Councillors Sumbul Siddiqui, E. Denise Simmons, and Timothy J. Toomey, as well as Mayor Marc C. McGovern, sponsored the order. Siddiqui and Simmons appeared at a HGSU-UAW rally last month. Simmons called Harvard’s treatment of its graduate student workers “embarrassing” in remarks before the order came up for a vote. “To date, more than 23 meetings have been held, including full bargaining sessions, as well as smaller group subcommittee meetings to focusing on specific proposals,” he wrote. —Staff writer James S. Bikales can be reached at james.bikales@thecrimson.com. Follow him on Twitter @jamepdx.